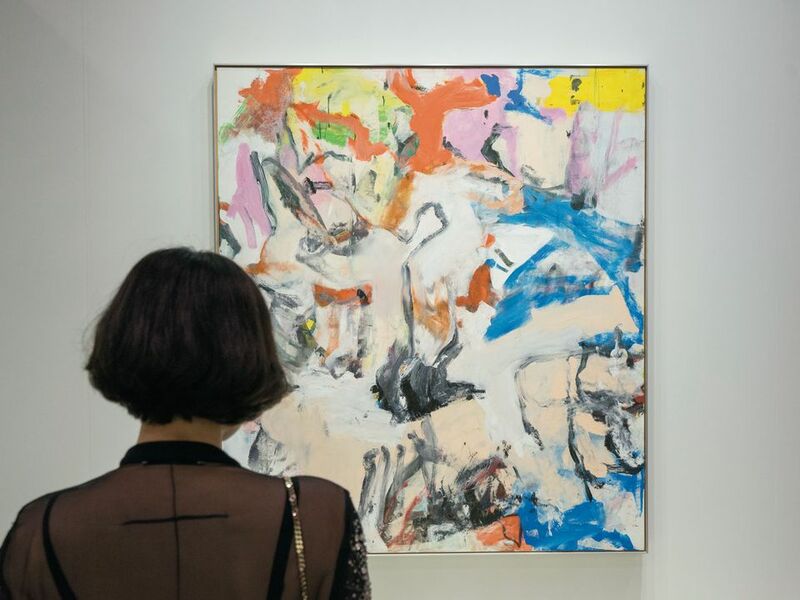 Within the first two hours of Art Basel in Hong Kong’s (ABHK) opening on Tuesday, Lévy Gorvy gallery had sold a 1975 painting by Willem de Kooning with a $35m price tag, making it the most expensive purchase ever reported at the fair. The abstract canvas was sold by the Microsoft co-founder and billionaire Paul Allen, who bought it for an undisclosed sum in 2001. The gallery declined to comment on the nationality of the buyer, although, just before the fair opened, the gallery’s co-founder Brett Gorvy told The Art Newspaper—while glancing hurriedly at his watch—that an “Asian gentleman” was en route to view the painting within the next 45 minutes. “We have a policy that buyers can only put things on reserve for an hour,” Gorvy says. The gallery was keen to stress that the deal was done in Hong Kong. Adeline Ooi, the director of ABHK, says the sale is “a clear indication of the strength of the market in Asia, how it has developed and the belief in the fair”. However, Chinese buying has been complicated in the past year by a number of factors. These include Beijing’s tightening of capital controls and greater scrutiny on credit purchases, including works of art. In December, the Chinese authorities capped overseas withdrawals using Chinese bank cards at Rmb100,000 ($15,900) a year. The annual foreign exchange quota per person was kept at $50,000. A European dealer who wanted to remain anonymous says that two sales made to mainland Chinese collectors at the fair last year subsequently fell through. “The buyers couldn’t pay for the works because of the limit on credit,” he says. Another US dealer says purchases are coming under greater scrutiny in Beijing than in Shanghai. Some Chinese collectors are finding ways around these financial restrictions. Anthony Tao, the director of Hong Kong’s Gallery Exit, says that many Chinese big spenders either have second homes in Hong Kong or abroad, giving them access to overseas bank accounts, or they pay in US dollars. David Zwirner gallery, which opened a space in Hong Kong’s H Queen’s building in January, made two sales to mainland collectors during the fair’s preview, according to a spokeswoman. But, David Zwirner says that capital controls “make it hard for the Chinese to pay for what they buy, and it impacts culture imported into China”. As Chinese buying is hemmed in, another Asian powerhouse is becoming more prominent. Taiwan, the most politically progressive territory in East Asia and ranking fifth in some global wealth reports, has an established collector base. At the fair this week, Taiwanese collectors including Rudy Tseng, R.C. Chen and Patrick Sun (who is based in Taipei as well as Hong Kong) were out in force. Tseng would not discuss his “multiple” purchases at the fair, saying that Taiwanese collectors prefer to “remain discreet”. But Asian artists who are “active on the international scene” such as Danh Vo and Haegue Yang are among his favourites, he says. Magnus Renfrew, the co-founder of ART HK, which became ABHK in 2013, is banking on the strength of the Taiwanese market, launching a new fair in Taipei next January. He cites the strong history of collecting (not only for contemporary works, but also for antiquities and classical paintings), as well as the established gallery scene as reasons for opening in Taiwan. Renfrew says he is aiming for 80 galleries for the fair, including around 20 from Taiwan. “The vast majority will come from Asia, or have a presence in Asia,” he says. The new fair, called Taipei Dangdai, joins the long-running Art Taipei fair, which takes place in October. Taipei Dangdai is supported by UBS investment bank, which also sponsors Art Basel and crucially has access to ultra-high net worth individuals. But Renfrew stresses that the fair is keen “to build a collector base at every level and across Taiwan”. He also expects collectors to attend from Hong Kong, Japan, Korea and Shanghai. Chi-Wen Huang, the founder of the established Taipei-based Chi-Wen gallery, which specialises in Taiwanese video art, questions whether there is an appetite for contemporary art in Taiwan. Tastes have shifted towards the Modern in recent years, she says. Simon Kirby of London’s Victoria Miro gallery says Taiwan accounts for 30% of its Asian sales. “Taiwanese collectors have been out of the spotlight, and that suits them, but I feel they are now ready to raise their profile,” he says.